Does your roof need painting? If it does National Capital Roofing are by far the best people to do the job. Canberra’s climate is not perfectly suited to the health of your roof and if it had a choice it would rather be somewhere else. Let’s face it, if we made the decision purely based on the weather most of us would. Your roof has to cope with the wild fluctuations in temperature, including the pounding sun of summer and the howling winds of winter, not to mention the ferocious storms. All of this has an impact on your roof and an occasional repainting can do a lot to maintain its integrity and extend its lifespan. What are the benefits of roof painting? The obvious and most immediate benefit of a newly painted roof is that it will instantly improve the appearance of your home, making it stand out among your neighbours. 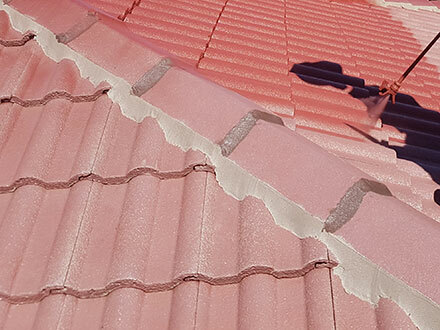 It will increase the lifespan of your roof, particularly if it is colorbond roofing, which will save you a lot of money in the long term. A well-painted roof prevents the growth of lichen and algae, which helps to avoid leaks and other damage. This will also save you money, as you won’t have to pay for the roof to be repaired or replaced. An attractive roof will increase the property value of your home. When a person arrives at the front of your house one of the first things they see is your roof and it’s important to make a strong first impression. Why should I hire somebody to paint my roof? Roof painting is one of those jobs that seems deceptively easy, so much so that a lot of people try to do it themselves. This can often be a costly mistake. There are many factors that need to be taken into account when painting a roof, including its shape and overall condition. It can be very difficult to adequately paint the entire roof while achieving an even coating that will make it look its best. To give just one example of the many possible errors that would make your efforts and expense redundant, it is vitally important that all lichens and mosses are removed from the roof’s surface to make sure the paint bonds properly. This requires the keen eye of a trained professional and a high-pressure hose like the ones National Capital Roofing will bring to your home – your backyard hose simple won’t be up to the job. Beside all of that, roof painting is a very risky job. You would need to work high above the ground in conditions you are not familiar with and any slip can be disastrous. It is much better to leave it in the hands of trained professionals with years of experience. The roofing market is flooded with disreputable workmen and companies who rob homeowners by carrying out shoddy work. Worst is that it can be months or even longer before you realise you have been ripped off. If you are going to invest in a newly painted roof make sure you employ somebody with the experience and reputation of National Capital Roofing. We are fully certified, offering strong guarantees and warranties that we stand firmly behind. This will give you full peace of mind as you enjoy your freshly painted roof.